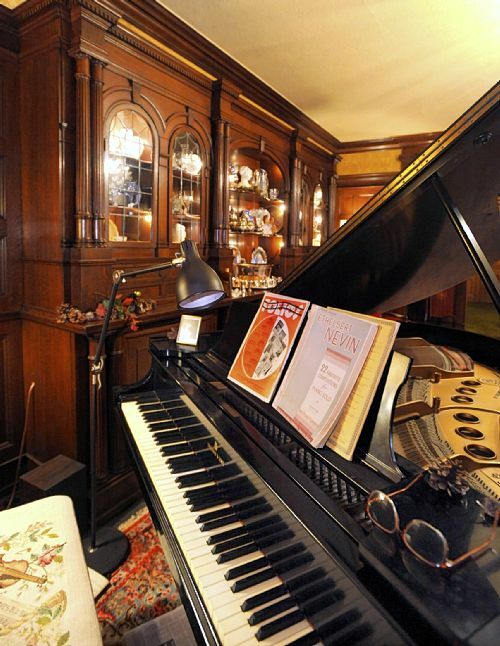 Here’s your chance to explore one of Pittsburgh’s most elegant private clubs. Join us Wed. evening, Feb. 2, 2011, from 5:30 to 9:00 p.m., at the Pittsburgh Athletic Association, 4215 Fifth Avenue, Pittsburgh, PA 15213 (Oakland). 6:00: Illustrated lecture by David J. Vater, RA and PHLF Trustee, on the architects and on the significant design features of the PAA. 6:30: Guided tour of the clubhouse, including the swimming pool, basketball court, and bowling alley. 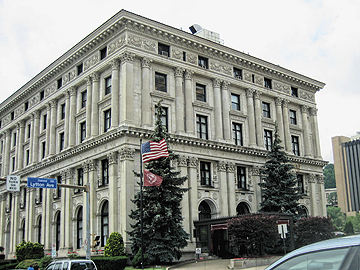 The Pittsburgh Athletic Association (Janssen & Abbott, architects, 1909-11) is one of the most elegant buildings, both inside and out, in Oakland’s Civic Center and is listed on the National Register of Historic Places. 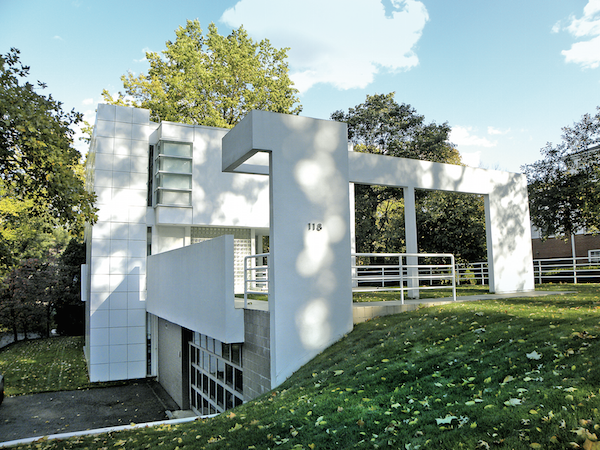 This event, on the occasion of the PAA’s centennial, is one in a series of private clubhouse tours organized by the Pittsburgh History & Landmarks Foundation for its members and friends. In previous years, Mr. Vater has led events at the Twentieth Century Club, Longue Vue Club, and Fox Chapel Golf Club. Reservations must be pre-paid by Thurs., Jan. 27, 2011. Valet parking is available in the PAA lot, via the entrance from Lytton Street. Purchase a parking token for $8 at the front desk of the Club. Parking is also available in the Soldiers and Sailors Museum garage on Bigelow Boulevard and in the Holiday Inn University Center garage on Lytton Street. Time: 5:30pm – 9:00 p.m. The Urban Redevelopment Authority has agreed to lease–with an option to sell–the 130,000-square-foot Fruit Auction Terminal Produce Building on Smallman Street in the Strip District. The Buncher Co. plans to turn the building into a thriving commercial space. To purchase the building, Buncher must commit to building 75-units of residential housing on the 55-acres of surface parking behind the Terminal Building. 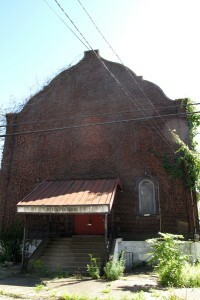 The firm must also promise to preserve the historic architecture. “The building really is at the end of its useful life. It needs anywhere from $6 to $10 million in capital improvements to bring it up to code and preserve it,” says Rob Stephany, executive director of the URA. According to Stephany, Buncher is about 20% of the way into their planning process, having selected the renowned historic preservation architect Albert Feloni to create a master plan for the Terminal Building. 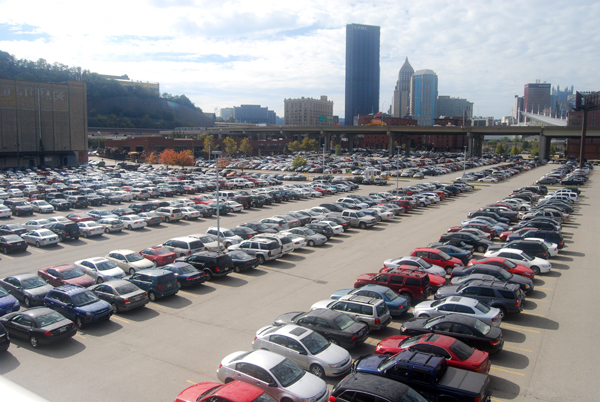 Astorino is under contract to do the master plan for the vacant surface parking along the river between the convention center and 41st Street. Once Buncher submits the master plans to the URA for review, the gears of construction can really start turning. Stephany says a recently conducted market analysis indicates the building would best benefit from restaurants, office, and showroom spaces on the platform, citing the Society for Contemporary Craft and The Pittsburgh Public Market as examples of forward-thinking reuse of these kinds of buildings. As part of the project, the URA and the City recently rezoned part of the Strip as a redevelopment area, causing concern from some neighborhood stakeholders who thought the URA might be preparing for eminent domain seizures. Stephany says that while this is certainly not the case, they didn’t do a good of a job in communicating their plans. Their intent was to make funds from investors more flexible. Sign up to receive Pop City each week. On Thanksgiving eve, when I called Alex Watson about previewing his house for next weekend’s Allegheny West Victorian Christmas House Tour, I assumed it would be too early to see it in holiday garb. When your house has been on the tour for 28 of the event’s 29 years, leaving the artificial tree up and decorated in a corner of the library seems the expedient thing to do. Next to it, on the mantel, stands the illuminated Dickens Christmas village Mr. Watson made decades ago of fiberboard, crowned by London’s St. Paul Cathedral and complete with Scrooge & Marley’s counting house. It’s now a year-round feature, too. And next to that, on the wainscot ledge, stand a dozen smaller buildings closer to home, representing Allegheny West houses that have appeared on neighborhood tours. He and his neighbors made those, too, for sale to tour-goers in years past. 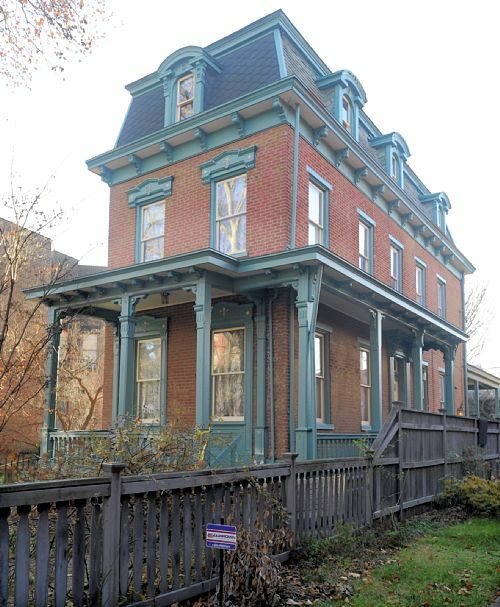 Anything to support his beloved Allegheny West, the North Side neighborhood in which he and his late partner, Merle Dickinson, settled in 1960, when they purchased the North Lincoln Avenue home. Then broken into 17 (now 10) apartments, it was far from the showplace it is today. 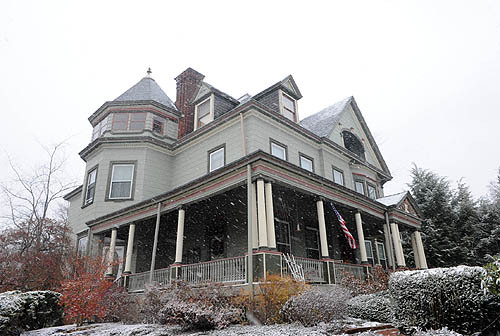 The red brick house, originally a two-story built between 1864 and 1865, was enlarged to its present three-story size and Romanesque Revival appearance in the early 1890s, when a library also was added to the front of the house. Grain merchant John W. Simpson was the original owner; Joseph Walton bought it in 1888 for daughter Ida Walton Scully and her husband, glass manufacturer James Scully. In 1917 the house was sold to James S. Childs, a shoe, rubber and leather wholesaler whose wife Alice was Ida Scully’s sister. In 1923 the house changed hands again; the new owners were Samuel and Margaret Crow, who lived there and rented rooms to boarders. The house stayed in the Crow family until 1960. The house’s architect is unknown; none surfaced during architectural historian Carol Peterson’s extensive house history research. Mr. Watson thinks it may have been Longfellow, Alden and Harlow, who in 1889 completed a house across the street commissioned by B. F. Jones for his daughter Elizabeth and her husband, Joseph O. Horne, son of the department store founder. It’s a good bet, considering the richly carved and paneled oak interior finishes, the melding of medieval and classical influences and a first-floor layout similar to the Horne house. The firm designed 13 buildings within a radius of several blocks and Frank Alden had lived just around the corner. 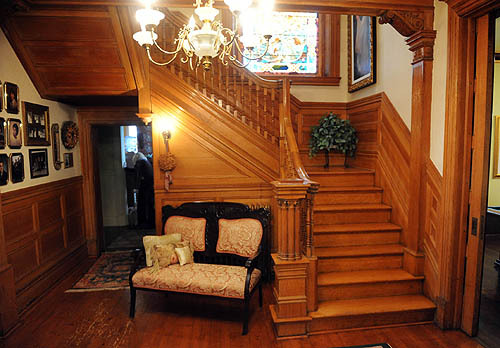 Restoring the home’s original features became a decades-long passion for Mr. Watson and Mr. Dickinson, who did much of the work themselves. And there was much work to do. 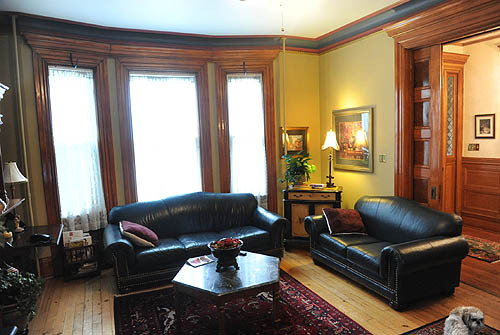 While most of the interior woodwork remained, the first floor’s front parlor, library and dining room had been its own apartment with kitchen and bath. 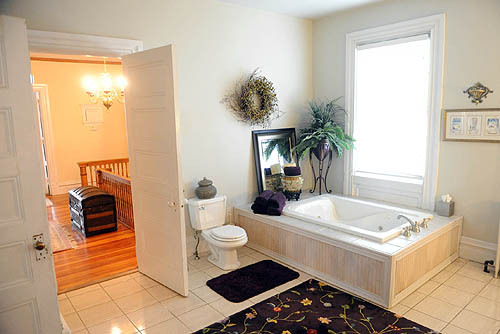 One bathroom occupied a corner of the entrance hall; during its removal, the owners discovered a long-lost corner of the hall’s original mantel. From that remnant, they re-created the mantel and over-mantel and warmed up the room with a gas fireplace. Mr. Watson has his regrets, including removal of a mantel and overmantel in the front parlor to gain wall space. 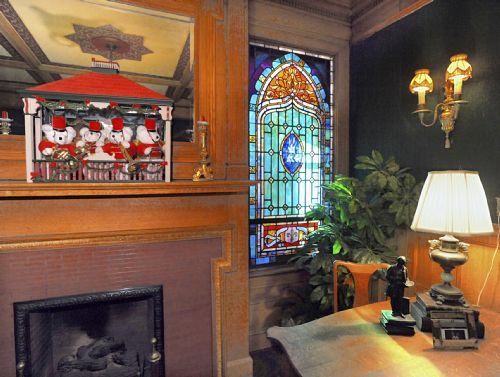 They recycled it as a bar and back bar in the former kitchen, now a game room outfitted as a bordello dedicated to 1920s neighborhood madam Nettie Gordon. Eventually, in atonement, they purchased a white marble Italianate mantel from a Sewickley house sale for the front parlor. Trained in nursery and landscape management at Michigan State, Mr. Watson managed the garden shop at Sears for 27 years before it became part of Allegheny Center. His courtyard garden, glimpsed through the oak-paneled music room windows, has been featured on neighborhood garden tours; this time tour-goers will pass through it as they leave. 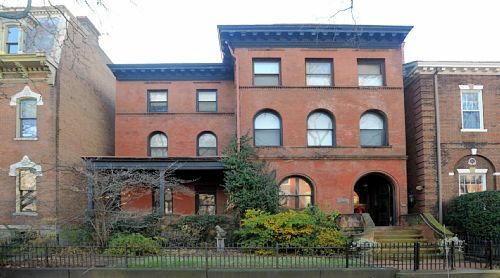 The six houses on the tour, spread over three blocks, include Gretchen Duthoy’s red brick, Second Empire-style Beech Avenue home, a newbie to the event. “My house was turning 150 this year,” said Ms. Duthoy, who wanted to do something to mark the occasion. She commissioned a house history from Ms. Peterson, who discovered the house in fact was 140 years old, having been built in 1870 for railroad conductor Theodore Gray and his wife Annie. The longest ownership — 1887 to 1922 — came with four generations of the family of Christian Stoner, partner in a Strip District lumber mill. When Ms. Duthoy, an Alcoa employee who grew up in suburban Maryland, bought the house in 2003, it had been restored by its previous owners, for whom she’d worked as a baby sitter in college. “That’s how I came to know the house and the neighborhood and that’s how I came to live there” a few years later when they had outgrown it, she said. 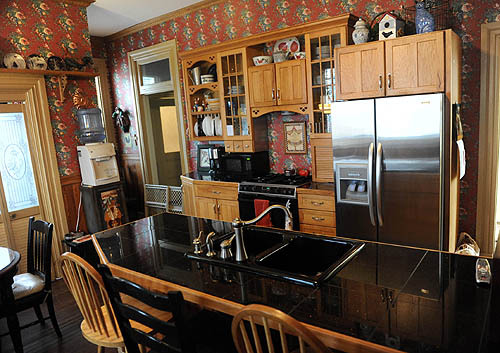 Her work on the house has been cosmetic, including a kitchen update. For the tour she’ll hang family ornaments on her live tree and decorate extensively with fresh greens. Information: Guided walking tours cost $25 per person and leave from Calvary United Methodist Church, Allegheny and Beech avenues, at 12-minute intervals from 5 to 8 p.m. Friday, and 10 a.m. to 8 p.m. next Saturday, with a maximum of 25 guests per tour. 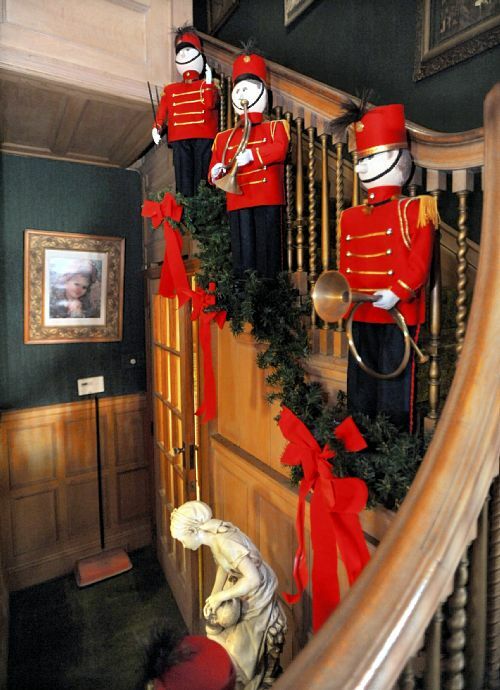 Tour guides will talk about 19th-century holiday traditions and the history of the neighborhood and the homes on the tour. 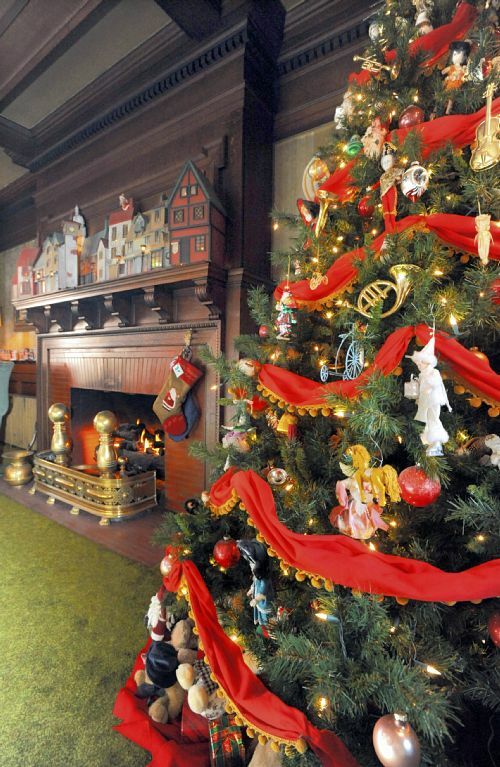 At the end of the event, which lasts about three hours, tour-goers can visit John DeSantis’ miniature railroad village and toy train collection at Holmes Hall, 719 Brighton Road, for an additional $10, as well as the Holiday Shoppe at Jones Hall, with antiques, gifts and handcrafted items. Mr. DeSantis’ train collection, open to the public only during the Christmas tour, also can be visited separately; hours are 7:30 to 10 p.m. Friday and 12:30 to 10 p.m. Saturday. 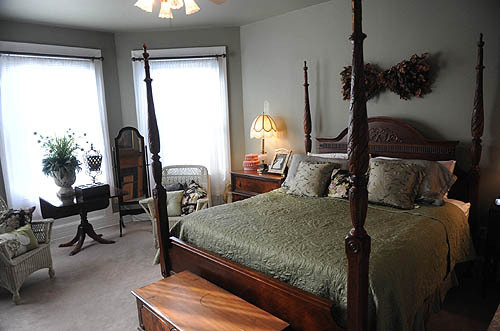 Special tours include a wine tour at 6 p.m. Friday, with wine tasting and hors d’oeuvres at a private residence, followed by the house tour ($75 per person). On Saturday, brunch tours will be offered at 10 and 10:30 a.m. and high-tea tours at 3 and 3:30 p.m. ($50 per person), followed by the house tour. With help from The Center for Hearing and Deaf Services, a signed tour will be offered at 3:36 p.m. Saturday ($25 per person). Tours are rain or shine, snow, sleet or hail. As the Allegheny West Civic Council’s website puts it, “This is Pittsburgh and bad weather is part of the charm.” Reservations are required for all tours and tickets are nonrefundable. Visit the website (alleghenywest.org) or call 412-323-8884.